Tuning In To The Brain's 'Cocktail Party Effect' Scientists are beginning to understand how the human brain accomplishes a remarkable trick. 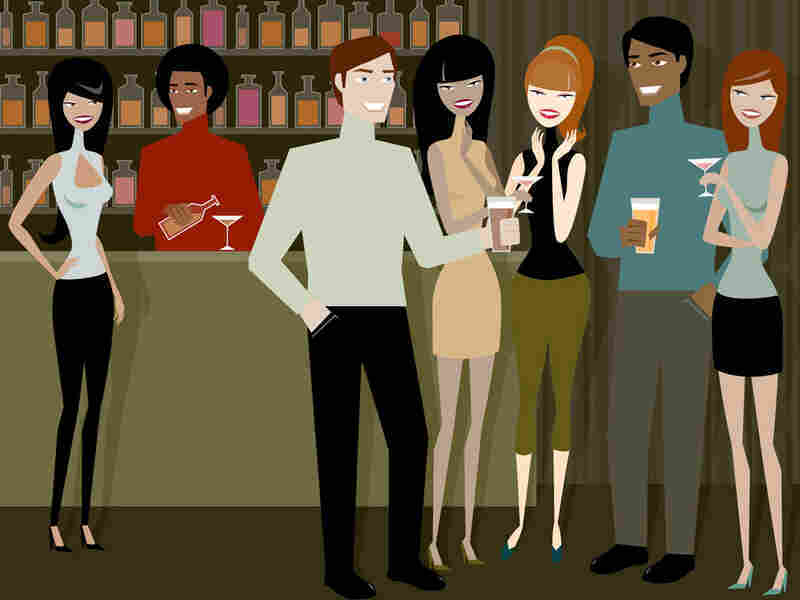 It's known as the cocktail party effect, and it's the ability to focus on the voice of one person in a room full of people who are just as loud. Scientists are beginning to understand how the human brain accomplishes a remarkable trick known as the cocktail party effect. It's what allows us to pick out the words from just one speaker even when we're in a room full of other voices that are just as loud. For decades, scientists have puzzled over how our brain is able to focus on certain sounds while filtering out others. Now they say they're finding clues, thanks to new research on birds and bats. Birds don't spend much time at cocktail parties, but they do face a similar auditory challenge, says Frederic Theunissen of the University of California, Berkeley. "Take a walk in the forest," Theunissen says. "It's clear that these animals are very vocal, and sometimes when there are large groups of them it becomes a cacophony of sounds -- just like when there's large groups of humans." And just like humans, some birds need to pick out just one voice in the crowd, Theunissen says. "In the species that I study, the zebra finch, they make lifelong couples, and it's very important for them to recognize their mate," he says. 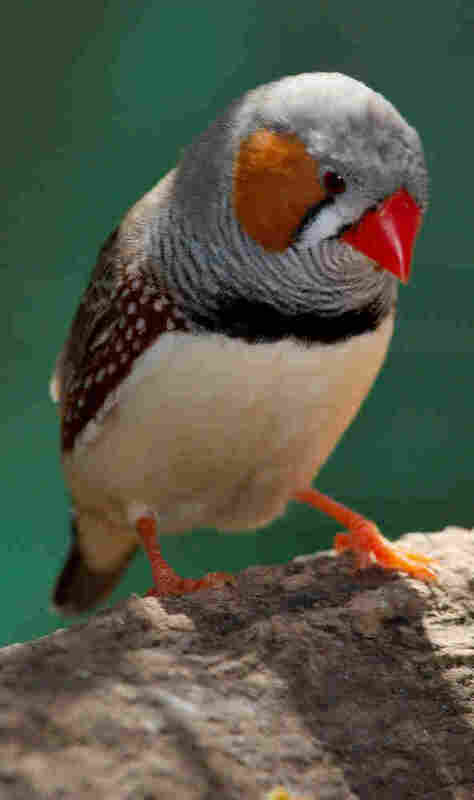 Theunissen and his colleague Channing Moore thought there must be brain circuits in a zebra finch that filter out unwanted sounds. So his lab began studying the brains of these birds while they listened to audio recordings. First they heard a familiar song all by itself. Then they heard the same song buried in white noise. "We kind of knew before what the responses were going to be to the song alone," Theunissen says. "So we were looking for brain areas where we would get a similar response when the song was embedded in noise." And they found some, he says. In these areas, there were individual brain cells that acted like a dog waiting for his master's voice -- they wouldn't respond to any other sound. Some of these cells also scanned relatively long stretches of sound, which allowed them to pick out a particular vocal feature, despite all the background noise. Humans probably do something similar when we're focusing on a guy with a nasal twang on the other side of the guacamole dip. Another explanation for the cocktail party effect comes from bats. They tend to live in large colonies that make a racket when they fly out of their caves at the end of the day. "Basically, we can think that the bats have a cocktail party every evening," says Jagmeet Kanwal, who studies mustached bats at Georgetown University. Basically, we can think that the bats have a cocktail party every evening. Bats face an even greater challenge than people when it comes to picking a single voice from a crowd, Kanwal says. That's because they have to contend with two streams of sound -- the first is from the constant echolocation noises they make to navigate and hunt for mosquitoes and other food. Much of that echolocation sound is beyond the range of the human ear. But to bats, it's as loud as a jet airplane. And amid that roar, Kanwal says, bats need to detect a separate stream of sound that they use to communicate. "And the communication sound is usually only one or two or three utterances and then it's gone," he says. "But it's very important for the animal to detect, because it may be, you know, 'I love you,' or 'get out of my way.' "
Kanwal's lab found brain cells in bats that actually did a better job of detecting communication sounds when there was a lot of background noise. "It's like somehow the system is designed [so] that in its natural setting -- when there is so much noise -- somehow the communication sound is even louder," he says. A closer look by Kanwal and his colleague Bridget Queenan showed that these special brain cells were doing two things to cut through the noise: They were telling other brain cells in the area to stay quiet, to stop responding to the background noise, and at the same time they were amplifying their own response, so their voice would be heard above the din. The next step is to figure out if there are cells in the human brain that do the same thing, Kanwal says. The research was presented at the 2010 Society for Neuroscience meeting in San Diego.